Chocks on a hydraulic swim platform—just one of the available options. Hoist it, tow it, flip it, or stow it. Dealing with your tender can be a pain in the transom, but you can improve things. Here’s how. There are some things in life that come in really handy when you need them, but are just a royal pain in the backside when you don’t. 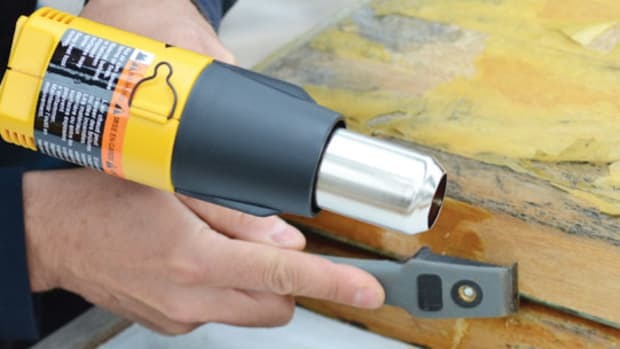 Certain tools, for example: When you need a 2-inch open-end wrench, a Stillson the size of an M1 carbine, or a 5-pound lump hammer, it’s nice to have one, but 99.99 percent of the time they just make your toolbox too heavy to lift. Same with crutches, flak jackets, anoraks, weight belts for diving, parachutes … heck, I could go on all day. But I’m not here to complain about all of life’s annoyances—just one of them: tenders (dinghies to some folks), and the ways and means of dealing with them. 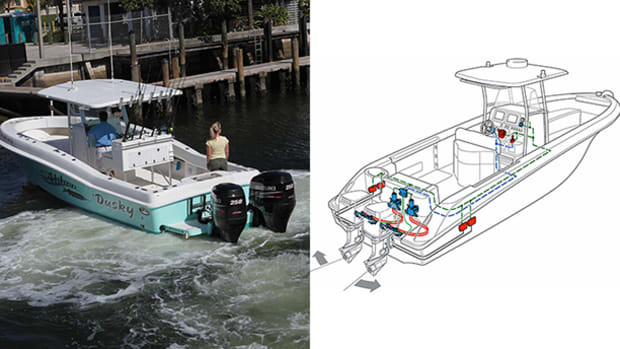 A tender is ideal, necessary really, for chasing back and forth from boat to shore when anchored or moored. 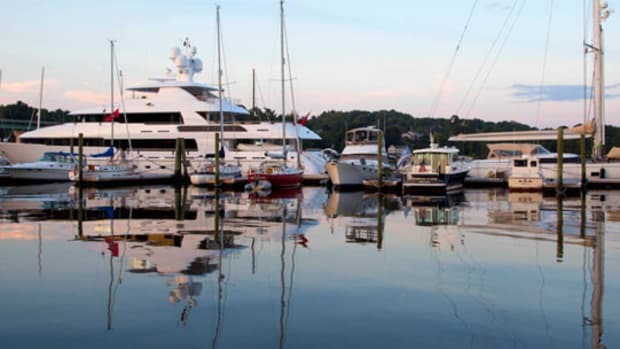 Many harbors have commercial launch services—the seagoing equivalent of Uber—but having one’s own transportation is best, and you don’t have to share a thwart with strangers. Sailors rely on the tender to carry out an anchor for kedging off after running aground, a procedure I know all too well. Kids love running around in a tender, exploring and doing whatever kids do when adults aren’t watching. Grown-ups like commandeering the tender and taking a ride themselves once in a while, too. Yep, whatever its function, a tender is really useful when it’s needed. But when it’s not needed, what do you do with your tender? Hang it on davits, tow it, flip it onto the swim platform, carry it on deck or, if it’s an inflatable, deflate and stow it? This is an eternal question pondered by seafarers the world over. 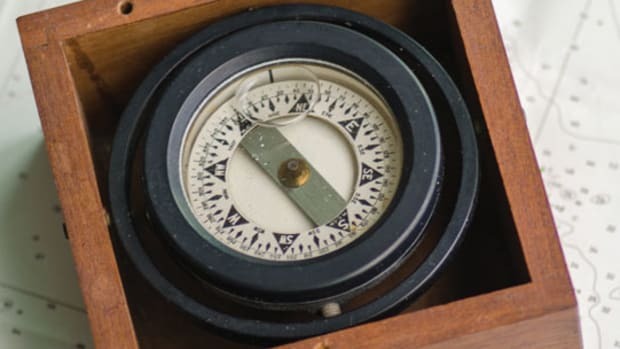 “Aside from the topic of weather, the subject of tenders would be the most talked about at the end of the day,” says Mark Griffin, via email from his homeport in Queensland, Australia. Griffin and I were high-school classmates, before he relocated to the Antipodes. He’s a lifetime sailor, surfer, and all-around waterman who now cruises far and wide aboard his catamaran, Cilla V. Since he spends many nights in idyllic, marina-free anchorages, Griffin’s tender is a vital piece of equipment, one whose care and feeding he takes very seriously. Griffin’s Cilla V has oversized padeyes on either side of her wide transom; once the tender is hoisted on the davits, it’s tied bow and stern to the padeyes so it can’t move. “Always remove the plug if rain is in the forecast, or if you’re making a rough passage and there’s the chance of taking water over the stern,” Griffin says. 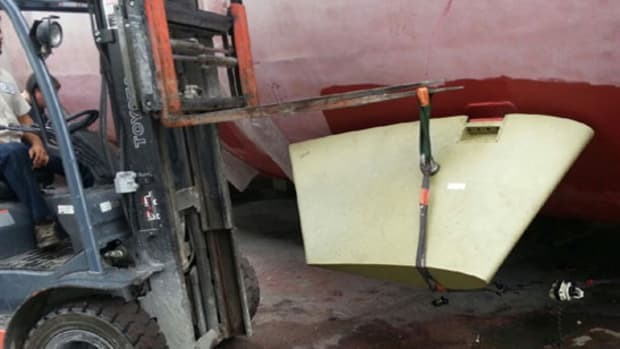 “A tender full of seawater will potentially put the safety of the boat and crew in jeopardy.” Moreover, the added weight and stress of water sloshing about in the tender can also rip the davits out, or at least compromise them. For most folks, davits are the answer for taming the tender, but choosing the best system takes research; there are a lot of different models on the market, sized to fit almost any boat and any tender. Some are permanently mounted, others are removable, some swivel while others are supported partly by the stern rails, some are manual, some electric or hydraulic, and so forth. Select davits that will easily carry the weight of your tender, since it’s probably heavier than you think it is, and you’ll doubtlessly hoist it with a gas tank, PFDs, cooler, and other gear on board. Don’t skimp on lifting capacity. I’d buy one size more than I need—heck, one day I might buy a heavier dinghy, or a bigger outboard. If you’re buying a new tender, pick it and the davits together to build the setup that works best for your boat, your needs, and, of course, your checkbook. Finally, advises Griffin, if you’re carrying your tender on davits and your passage or bar crossing is looking like it is going to be rough (Down Under, that means 20 knots of wind or more and at least 4- to 6-foot seas), the outboard should be stowed separately and securely on deck, and the fuel lines turned off. If your tender has a separate fuel tank for the outboard, stow it on deck, too, he adds. This fold-up solution from Weaver Snap Davit Systems can be fitted with stand-off arms to reduce abrasion associated with tie-downs. Got a swim platform? If so, traditional stern davits may not work, as many boats with molded-in platforms don’t have a place to mount them, and if they do, the hoisted tender will be hanging like the Sword of Damocles over the platform. Using the platform means launching the dinghy; in which case, removable davits make sense. Just dismount and stow them out of the way when the dink’s in the water so nobody whacks their head. Some manufacturers build conventional davits that mount directly on the swim platform, but if you choose this route make sure the tender is carried far enough above the waterline that it won’t be washed by following seas at low speed, or the boat’s own wake when dropping off plane. A better way to marry tender and platform is, in my opinion, to roll the tender onto its side and carry it vertically on the platform. 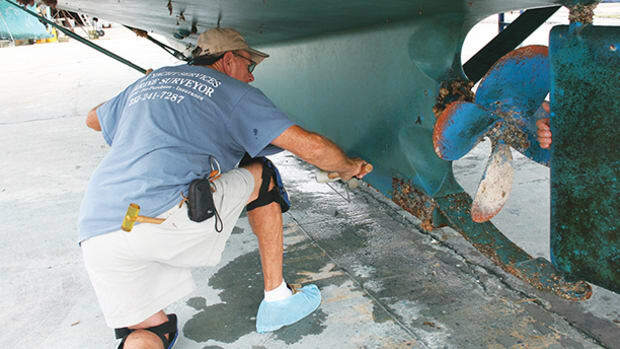 The simplest way to do this is to remove the outboard, then manhandle the tender into place, tipped up against the transom, and lash it with a cat’s cradle of lines. It’s not very elegant, but it works with inflatables and small RIBs, at least when the weather’s good. Most people will want something more sophisticated, and there are many systems on the market. Weaver Snap Davit Systems (weaverindustries.com), for example, consist of stainless steel mounts on the swim platform that connect with receivers attached to one side of the tender to create, essentially, a hinge between the two. A hydraulic hoisting arm (or plain ol’ muscle power) lifts the tender onto its side, where it’s held by the mounts and other hardware. What about the outboard? The Weaver Leaver, mounted on the tender’s transom, pivots the outboard as the dinghy’s tipped up, so it hangs vertically. 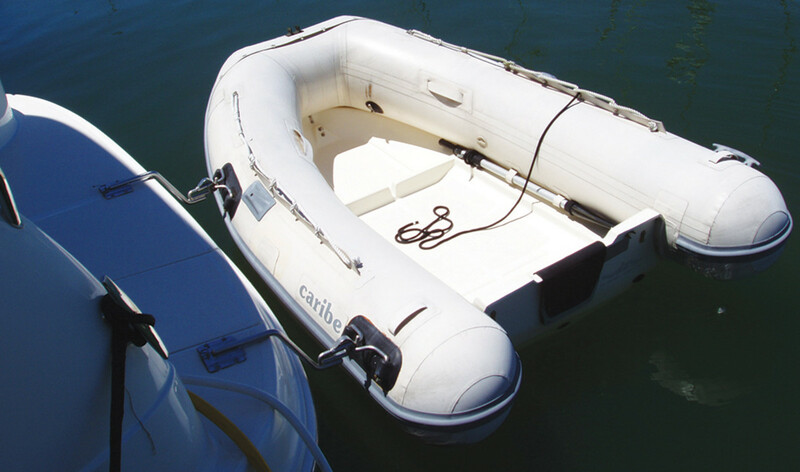 There are a myriad of bits and pieces to the Weaver system, depending on the type of tender, but there’s a setup for all sorts of inflatables and rigid dinghies. Weaver’s not the only game in town: SeaWise (seawisemarine.com) builds a similar, but fancier, system that uses either a manual or hydraulic lift to tilt the dinghy. It also includes a gimbal for the motor so it hangs vertically. Olsson Mfg. 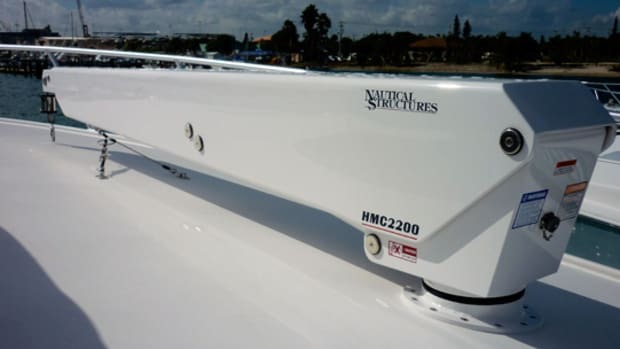 Inc. (boatdavit.com) builds manually operated davits that stow the tender on the swim platform more or less on an even keel, tipped just enough to keep it clear of the water. Not my choice, but the company also makes innovative hydraulic davits for stern mounting; rather than hoist with rope or a cable, the entire davit pivots down to attach to the tender, then pivots back up to raise it. I’d hang my tender over the platform on a set of those. 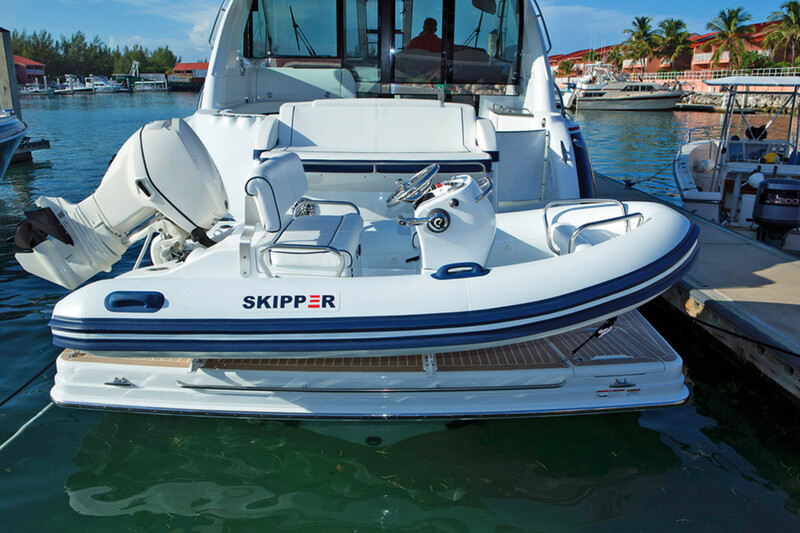 If tipping the tender doesn’t float your boat, there are slide-up “davits.” You pull the dinghy out of the water on a miniature version of a shipyard railway if the tender is small and light enough, that is. Or you can go for the whole enchilada and install a hydraulic lifting platform, an extension of the swim platform. Your tender will sit in chocks on an even keel. Lifts are complex and expensive, and adding one is easiest when the boat’s being built, but aftermarket models can work, too. Talk to your boatyard about this. And one last thing. 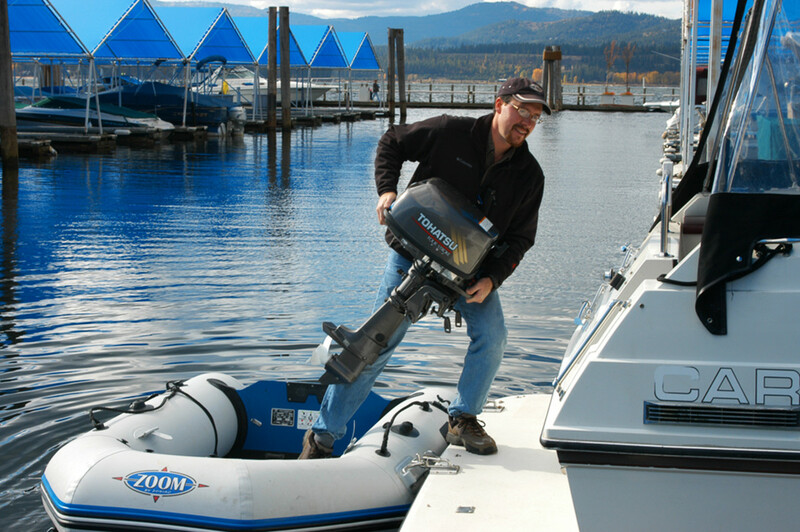 If you want to carry your tender on (or at least in the vicinity of) the swim platform, but don’t want to spend big bucks on an aftermarket hydraulic lift, check out FreedomLift (freedomlift.com). The company builds hydraulic arms that mount against the transom below the swim platform; the arms lift the tender out of the water and carry it higher than, and abaft, the platform, and then finally deposit it on the platform level in chocks. When not needed, the arms are easy to remove. 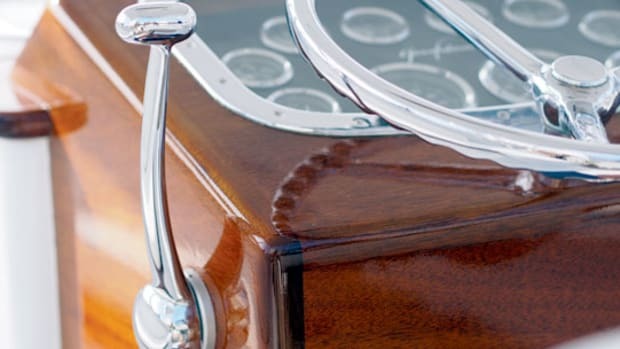 If your boat’s big enough to carry a tender in chocks on the foredeck, or on a boat deck aft of the flying bridge or upper helm, that’s the gold standard, in my opinion. But it takes deck space and a powerful hydraulic crane to handle a tender of any size. Some trawlers have a mast and boom that can lift a lightweight inflatable onto the boat deck using a winch-powered block and tackle. It’s a little work to haul the boat up there, but once in the chocks, it’s as safe as it can get. 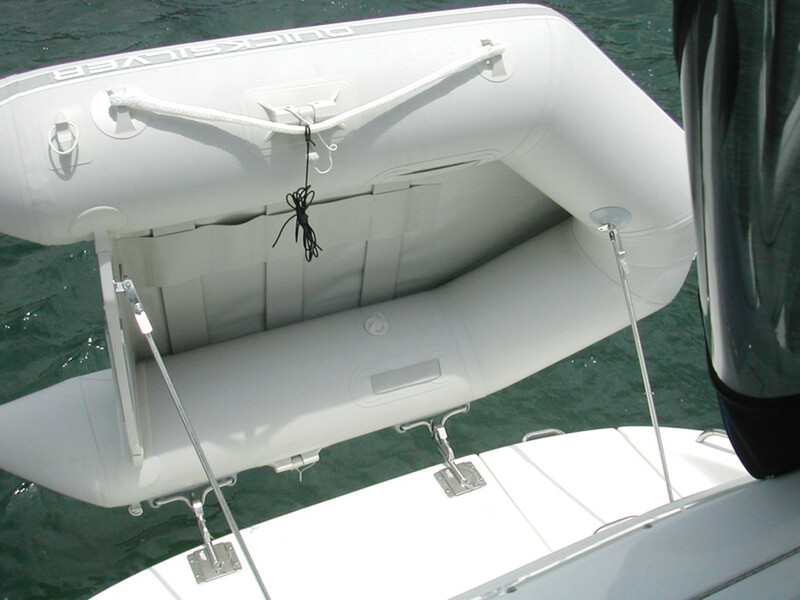 At the other end of the spectrum, a soft-bottom inflatable can be deflated and stowed in a locker when not needed, or lashed upside-down on the foredeck between dinghy adventures. The outboard will be happy clamped to a mount on the stern rail; install a single hoist to lift it. St. Croix Marine Products (davit.com) builds small cranes just for this purpose. The older I get, the less I look forward to wrestling a motor on and off the tender, so for me, and maybe for you, too, the crane will be money well spent. Heck, such poetry makes me think about chucking this keyboard over the side and going cruising, and if I do, I’ll treat my tender with more respect, take the steps necessary to keep it happy, and make sure it has a nice place to live on board when not on duty. You might want to do the same.